The first inaugural Keystone awards will honor the women who exemplify characteristics that strengthen and support the business of mortgage. Meet the finalists and the nominees of these awards. In this exclusive interview, Marion McDougall, EVP, Chief Loan Administration Officer, Caliber Home Loans shares what she has learned from a career spanning 30 years in financial services. 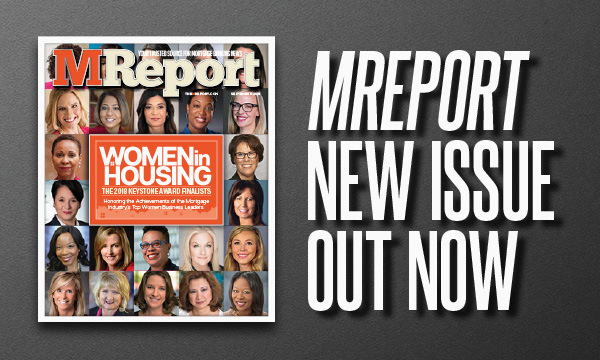 Yvette Gilmore, VP, Servicer Relationship & Performance Management at Freddie Mac speaks to MReport about the GSE's Servicing Success Program and how servicers can reimagine the business in an industry environment that is constantly changing. Get the latest in the mortgage tech industry in our MTech section and learn who’s moving on and who’s moving up in the industry in MCrowd. Read our MDwell to learn more about which U.S. cities were ranked the best for working women. All of this and more is waiting for you inside the latest edition of MReport magazine, out on September 1, 2018. Click here  to access the digital archives.